Our selection of Baby Gifts is exquisite, and pictures don't do anything justice in this category! 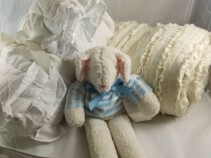 Order your baby gift today, and we can send it to you, or directly to the giftee. Or, we can deliver it to anyone in the River Valley Area. We have many more baby items in store, so if you are looking for something specific, we just might have it... give us a call at 608-588-9999 and we are happy to check for you. HAND KNIT BABY SOCKS - Adorable Socks Hand Knit with 100% organic cotton yarns, fit newborn baby. Specify boy or girl (for blue or pink ribbon). $14.00. ----------------------------------------------------------------------------------------------------------- HAND KNIT BABY PANTS - Hand Knit pants made with 100% organic cotton. Support organic farmers and give your baby the best. 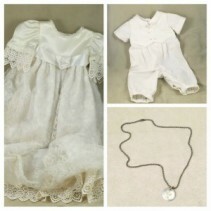 Specify size 0 - 6 mo. or 6 - 12 mo. $38.00. ---------------------------------------------------------------------------------------------------- HAND KNIT BABY SWEATER - Hand Knit sweater made with 100% organic cotton. Support organic farmers and give your baby the best. Specify size 0 - 6 mo. or 6 - 12 mo. $44.00 ------------------------------------------------------------------------------------------------------ SET INCLUDES ALL THREE ITEMS, SWEATER, PANTS AND SOCKS FOR $96.00, OR WE CAN SELL INDIVIDUALLY. BABY'S HAND KNIT CAP - Cute and Warm Hand Knit Cap made with 100% organic cotton. Support organic farmers and give your baby the best. Newborn Size - $23.95. ------------------------------------------------------------------------------------------------------------- BABY'S HAND KNIT PANTS - Hand Knit pants made with 100% organic cotton. Support organic farmers and give your baby the best. Specify 0 - 6 mo. 6 - 12 mo. $38.00. ----------------------------------------------------------------------------------------------------------- BABY'S HAND KNIT GIRLS SWEATER - Very cute hand knit sweater made with 100% organic cotton. Support organic farmers and give your baby the best. Specify size 0 - 6 mo. or 6 - 12 mo. $44.00 --------------------------------------------------------------------------------------------------- HAND KNIT BABY GIRL HEADBAND - pink with rosette, locally made. 0 - 12 month size, but can custom order any size or color. $10.95. ----------------------------------------------------------------------------------------------------------- CAN ORDER AS A SET (PLEASE SPECIFY HEADBAND OR CAP) OR INDIVIDUALLY. BABY HAND KNIT SOCKS - Hand knit with 100% organic cotton. Newborn size. $14.00. -------------------------------------------------------------------------------------------------------- BABY HAND KNIT PANTS - Hand knit with 100% organic cotton. Support organic farmers and give your baby the best. Specify 0 - 6 mo. or 6 - 12 mo. size. $39.00. --------------------------------------------------------------------------------------------------- BABY HAND KNIT BOYS SWEATER - Hand knit with 100% organic cotton and trimmed with a pretty blue stripe and gray velvet buttons. Support organic farmers and give your baby the best. 0 - 6 mo. size. 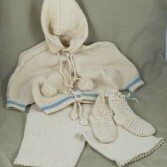 $46.00 ------------------------------------------------------------------------------------------------------ BABY HANDKNIT BOYS SWEATER SET - order all 3 items for $99.00 or order individually. BASHFUL BUNNY GRABBER - This soft little bunny is easy for little ones to grab, measures 7.5" x 6". $14.00 ----------------------------------------------------------------------------------------------------------- BUNNY STUFFED ANIMAL - Plush and ready to cuddle at bedtime. 7.5in. 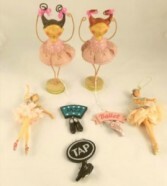 at $15.00 (shown), and 12in. at $24.00. 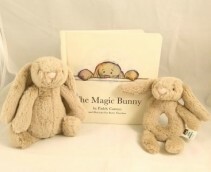 ------------------------------------------------------------------------------------------------------------ THE MAGIC BUNNY BOOK - This special book is a great read at bedtime, featuring a bunny that puts baby's fears to rest because he is on guard while baby is sleeping. Very cute book. $14.00. --------------------------------------------------------------------------------------------------------- NOT SHOWN, BUT ALSO AVAILABLE IS A BUNNY SOOTHER. An adorable little bunny with a cuddly snuggly little blankie attached. $22.00. ---------------------------------------------------------------------------------------------------- THE BOOK AND A BUNNY MAKE A GREAT GIFT! FARM BABY BATH AND BODY PRODUCTS - Our new lavender products for baby feature wholesome formulations that sooth, nourish and protect the delicate skin of little ones. Created with pure lavender oil, they also provide antibacterial properties and a relaxing aromatherapy experience. Good for both baby and caregiver. ------------------------------------------------------------------------------------------------ FARM BABY HEALING BABY BOTTOM CREAM - Farmbaby Bottom Cream is packed with nourishing herbal extracts including calendula and chamomile, both good for irritated skin, and tea tree oil used for its anti-fungal and antibacterial properties The moisture resistant barrier is made from all vegetable sources and contains shea butter. Use frequently for a comfortable and happy baby bottom. 2 oz. $8.95. --------------------------------------------------------------------------------------------- FARM BABY SUGAR BASED CLEANSER WITH ALOE - Our baby wash is an all over cleanser and doubles as a mild shampoo. Perfectly balanced and formulated for delicate skin, this gentle, dye-free soap is made from sugar based cleansers, vitamins, with a dose of aloe vera for moisture. 9 oz. $9.95. ----------------------------------------------------------------------------------------------------- FARM BABY RICH AND NOURISHING BARRIER LOTION - Our blend of shea butter, vitamins, and aloe vera is combined in perfect proportion to nourish delicate skin. Formulated with natural silicone, this cream acts as a moisture barrier and features lavender to help relax baby during fussy times. 9 oz. $9.95. ------------------------------------------------------------------------------------------------------------ FARM BABY ORGANIC CORNSTARCH POWDER - A safe and natural powder for your wee one. Made with organic cornstarch, arrowroot, and lavender oil, this talc and mineral free powder is soft and smooth, acting quickly to absorb any excess moisture from baby's skin. Perfect after bathing and for areas that are chafed or irritated. Make your baby comfortable and dry with this silky powder. 4 oz. $10.95. WHALE BABY GIFT ITEMS - baby whale items, beautifully done, and would make a great addition to your babies room. ------------------------------------------------------------------------------------------------------------ WHALE BABY ORNAMENT - Ceramic whale ornament, perfect to hang in baby's room. 3in. x 3in. $10.95. 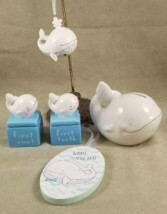 (stand not included) ----------------------------------------------------------------------------------------------------- WHALE BABY CERAMIC CONTAINERS WITH LIDS - select FIRST TOOTH OR FIRST CURL, 2in x 3in. $11.95. ------------------------------------------------------------------------------------------------------ WHALE BABY BANK - Ceramic whale bank for baby to save his pennies! Perfect size for little hands. 3in x 4.5in. $12.95 -------------------------------------------------------------------------------------------------- WHALE WOOD ORNAMENT - hanging ornament that says "Whale Hello There", 3in x 4.5in. $5.95. 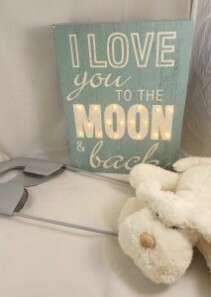 LOVE YOU TO THE MOON AND BACK SIGN - Very cute for baby's room or to give as a gift to your girlfriend, daughter, mom or grandma. 3.25in. square. $16.95. ------------------------------------------------------------------------------------------------------- RAIN, RAIN, GO AWAY SIGN - great to hang in a kids room. Wood and canvas. 3in square. $24.95. 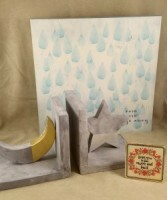 ---------------------------------------------------------------------------------------------------- STAR AND MOON BOOK ENDS - these are a nice weight that will hold up baby's books. 6in. square each one. Set is $38.95. LARGE DIAPER PIN WALL DECOR - Hang hangers on it, or photo's, etc. Very cute. Measures 25.5in x 8in. Specify blue, pink or white. $24.95. ------------------------------------------------------------------------------------------------------------ WHITE FLUFFY DOG STUFFED ANIMAL - This particular pug has big floppy ears and is very soft. He measures 14in. $29.95. We also have a large assortment of other plush in a variety of prices. ------------------------------------------------------------------------------------------------------- I LOVE YOU TO THE MOON & BACK LIT WALL SIGN - This wood sign lights up with batteries. Adorable, and the perfect gift for that special little baby to let them know just how you feel about them! 10.5in x 13.75in. $39.95. CUTE LITTLE ITTY BITTY'S - little trinket dishes, bowls and paper weights vary in price from $6.95 to $10.00. ------------------------------------------------------------------------------------------------------------- OLLIE OWL GRABBER - Cute plush little toy for baby to grab. Choose from Ollie Owl or Bashful Bunny. 7.5in x 6in. $14.00. ----------------------------------------------------------------------------------------------------------- BABY BLANKETS - 100% Cotton knit snuggly AND cute blankets, select from gray with light blue elephants, blue with white whales, or light gray with cream hearts. $46.95. LAMB BEAN BAG DOLL - soft and cuddly doll with a striped t-shirt. Approximately 13 inches. $36.00. ---------------------------------------------------------------------------------------------------------- IVORY ALL COTTON BEDDING ITEMS - A vintage tuck ruffle pattern with a vintage look. Select from a sham $39.00, Baby Quilt 36in x 50in. $58.00. a Twin Quilt 69in x 90in. $168.00. ---------------------------------------------------------------------------------------------------- WHITE ALL COTTON BABY NURSERY QUILT - Very elegant quilt. 35in x 49in, $93.00. BOOK MARKS - "This book belongs to the worlds best son", 15in. x 6in. $2.50. 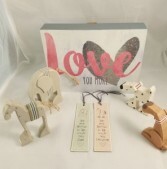 --------------------------------------------------------------------------------------------------------------- WOOD CRITTERS - look cute on your shelf in your kids rooms, or just attached to a present. Specify horse, elephant, white dog or brown dog. $12.50 small, $17.50 large. ----------------------------------------------------------------------------------------------------- LOVE YOU MORE WALL SIGN - wood and canvas - 8in x 10in. $19.95. GIRAFFE BABY HAT AND DIAPER COVER GIFT SET - very plush and very cute. newborn size. $26.95. ----------------------------------------------------------------------------------------------------------------- GIRAFFE BABY PICTURE FRAME - ceramic to hold a picture of your little cutie. measures 7.25in x 9.25in. holds a 4 x 6" picture. $26.95. --------------------------------------------------------------------------------------------------------- GIRAFFE BLANKET & RATTLE - soft and plush blanket measures 24in x 24in. $33.95. BABY TRAINING UNDIES - Announce to the world so that everyone can beon the lookout. Toddlers will love becoming a big kid with these silly undies. 100% cotton, specify boy or girl. 25 - 30 lbs. $7.95 ----------------------------------------------------------------------------------------------------------- TODDLERS SLIPPERS - Soft and snuggly slippers that are fun to wear while keeping your feet warm. You'll wish you were a kid again. Choose Bunny or Dog. medium or large. $15.00. 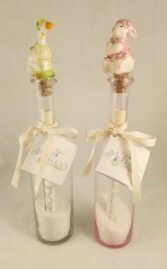 MOTHERS MESSAGE IN A BOTTLE - A beautiful keepsake idea. 14" high glass bottle holds sand and a rolled up script that you write your message on. A wonderful message example is on the name tag that you can use or you can write something else. It reads as follows: "Greetings, little one, welcome to this place. I've waited for this moment, it's so nice to see your face. I'll hold you close and guide you, you are my blessing from above... to teach and stand beside you and wrap you in my love." Select Duck or Rabbit. Boxed, $22.00. BABY BLING HEADBANDS - Baby tested. Mama approved. For over 10 years baby bling headbands have been preferred by moms everywhere as their #1 choice for baby and toddler hair accessories. Many solid colors, stripes and prints in stock and ready to ship. Call to see what's in stock today. Fits baby to toddler. Solids are $11.95. Stripes and Prints are $13.95. 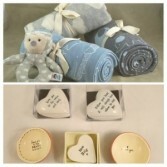 BABY HANDPRINT KIT - Create a keepsake with our one-of-a-kind baby gift. Kit includes a blue or pink colored round 6" tin with non-toxic plaster and instructions. Specify boy or girl. $12.00. --------------------------------------------------------------------------------------------------------- CRAYONS ON THE GO SET - Roll up crayon pockets are the perfect thing to throw in mommy's purse, or keep in the car. Be creative wherever you go! Fabrics vary. $15.95. 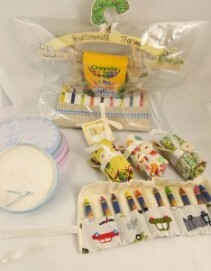 ------------------------------------------------------------------------------------------------------- COTTON APRON WITH CRAYON POCKETS - Includes a cream apron with blue and white check trim, and washable Crayola brand crayons on a hanger. Fits toddlers. $31.00. 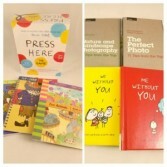 ASSORTED BOOKS - we offer a nice selection of great books for kids. Call today for some titles and prices starting at $9.95 -------------------------------------------------------------------------------------------------------------- ASSORTED ACTIVITY BOOKS - select from sticker books, doodle books, drawing books, etc. We offer books that are engaging, and sure to entertain. Our selection changes regularly, so please call to see what's on hand today, starting at $5.95.